Muffins are such a dear, to eat, to make, in short to fill us up quicker and faster.I esp. luv savory muffins. Any variation that you can think of, you can turn it into a muffin. I usually make muffins, little festive than the usual fat free, calorie free(!! ), taste free(!!) 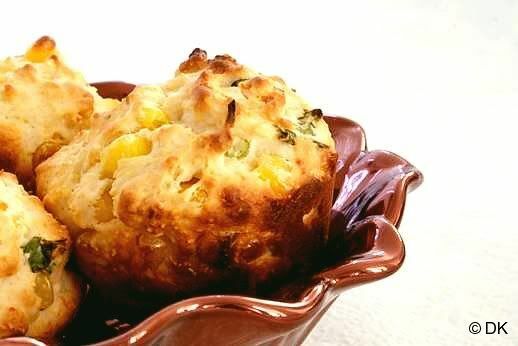 when I go for those light lunches and dinners.This corn muffin would be perfect for those moments.I always have frozen corn and cheddar lying around in my fridge. 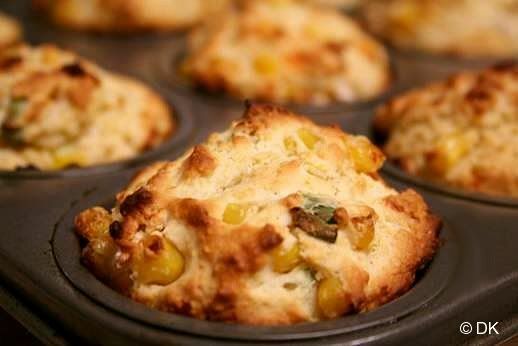 The last time when I cleaned out my fridge to get new stuff, I saw wee bit of corn and small slab of cheddar lying around and thought of making these corn muffins. They are yummy and filling and this recipe comes from my neighbor which I tweaked a bit to suit my pantry. 2. 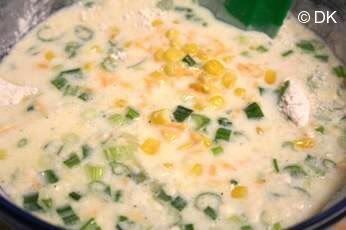 In a separate bowl, add milk,corn,eggs,butter,onions,salt,pepper and cheddar together. Whisk until blended. 5. Drop spoonful of this micture into greased muffin cups. 6. Bake these in a preheated 415F oven for 20-25 min until golden. If not using egg whites, would it be prudent to add some BP? 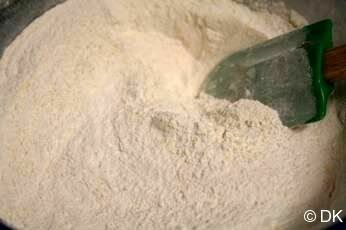 Can i use wheat flour instead of self raising flour?? if using all purpose flour what should be the quantity of baking powder and salt added for this recipe?? Hellos, I have been following your site since sometimes last year! Love all your recipes, have also tried quite a few. Must say, you make cooking very simple for us novices :) I was wondering if I can use all purpose flour instead of self-raising flour? If so, what are the proportions? I usually have Trader Joe's Pancake/Baking mix lying around in my house. Can I use that? hey there, was wondering if these muffins could be made without the cheese. will the taste alter? we screwed this up somehow - probably because we didnt have all the ingredients and mum said to put in baking powder, which we did. it is a shame as we made 24 muffins and a loaf and we're hungry now. mum said 'sometimes it just doesnt work - perhaps because of the weather'. what was the weather when you made the ones in the photos? did you use photoshop in the photos? it's not fair. we want nice muffins and instead we've got chunky ones that are a bit goopy. Savory muffins is almost a staple in our home over weekends. Love all the falvors you have added!!! If you're interested in a highly entertaining read about fat NOT being evil, and real food being better for you, check out Michael Pollan's "In defense of food." It's a real eye opener. Also, these are totally getting bookmarked. They look perfect for a decent nibble during the day, you're right! Thank you girls..am glad u like it. I love the smell of corn cakes baking! Your corn muffins look great. I have a big bag of masa harina sitting around, im wonderinf if that will work in this recipe? corn muffins look perfect , well aerated and spongy soft! and the crucial time is in between lunch and dinner for me too!! Love corn muffins a lot. 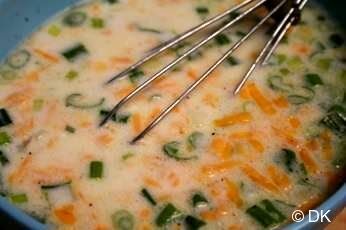 Looks so colorful and Yummy... Nice recipe. Loved the combination of flavors. YUM! 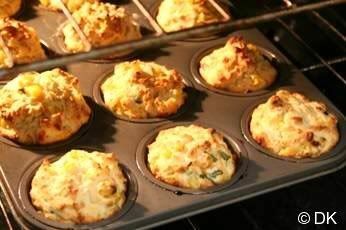 I love savory muffins, I would love to have with chili. Actually I made one eggless for Madhu's event and will be posting soon. I bookmarked this one, would be a great breakfast or lunch! Recently I saw something similar in Food TV. Rachel Ray added broccoli too. I have to try this version the next time. They look moist and decadent. Would probably taste great with chili too. Corn muffins are one of my favorites. I like that you included cheese too. 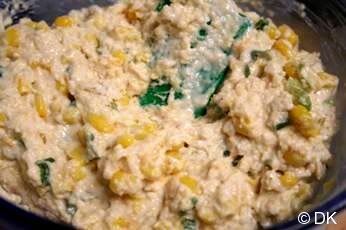 Love the cheese and corn combo! Savory Muffins looks very delicious DK. It's nice to use savory when you are not feeling to eat anything sweet. 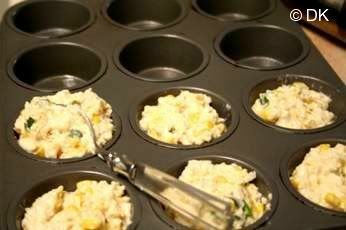 corn muffins looks wonderful DK..new to me..i like your step by step procedure along with pics!! As usual looks beautiful and I also have items lying down in my fridge for a long time. Hopefully will make it tomorrow.